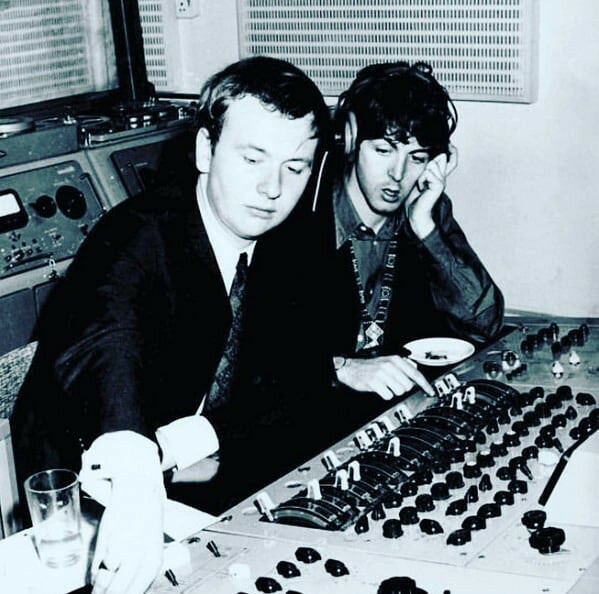 Geoff Emerick, the long-standing Abbey Road studio engineer whose inventive recording techniques helped The Beatles make vast artistic leaps in the mid'-60s, has died. The news comes from his personal Twitter, Facebook, and YouTube accounts, with his manager sharing information that Emerick suffered a heart attack October 2 at the age of 72. No other information is available at this time. Emerick came up in the EMI Studios system, a famously strict environment for both engineers and artists alike. In 1966, at the age of 20, he got the chance to step into a Beatles session. With George Martin as the creative producer—and the band members just beginning to think of the studio as an instrument worth exploring in its own right—Emerick was able to bring his own innovations to the mix. He wrote about his experimental techniques in great detail in his 2006 book, Here, There and Everywhere: My Life Recording the Music of The Beatles. They yielded such iconic moments as John Lennon's Leslie-drenched vocal in "Tomorrow Never Knows" and Paul McCartney's propulsive bassline in "Paperback Writer." That bassline was captured using a re-wired speaker as a microphone—a recording trick, like the Leslie vocal—that would be used by many more engineers and producers over the years. From this auspicious beginning, Emerick began a renowned career outside of The Beatles, beginning with The Zombie's 1968 masterpiece Odessey and Oracle. He produced his first record with Badfinger's 1970 release No Dice. And he continued to work closely with McCartney, serving as engineer on his first solo record, as well as Paul and Linda McCartney's Ram. In 1973, he co-produced Wings' Band on the Run. Throughout the '70s and '80s, Emerick worked with Mahavishnu Orchestra, Robin Trower, America, Stealers Wheel, Cheap Trick, Supertramp, and many others. He produced Elvis Costello's 1982 Imperial Bedroom. In recent years, he had lived in Los Angeles, sharing his knowledge in audio classes while continuing to record Costello (on 2015's Unfaithful Music), McCartney (2016's Pure McCartney), and other artists from his long and storied career.